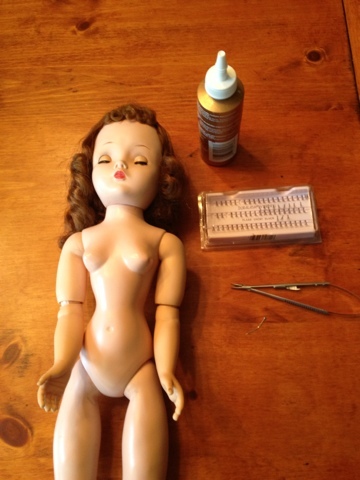 Materials for replacing doll eyelashes. 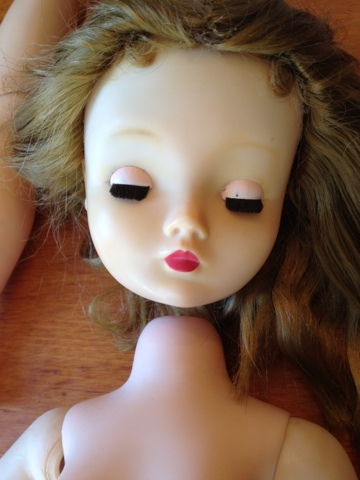 Many readers of this blog inquire about replacing doll eyelashes. 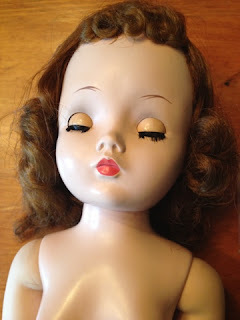 The loss of eyelashes is a particular problem for the old 1930s-50s hard plastic and composition dolls. The old weighted sleep eyes have a little channel in the eyelid which holds the brush lashes. After a while the brush lashes often rot or deteriorate and fall out. 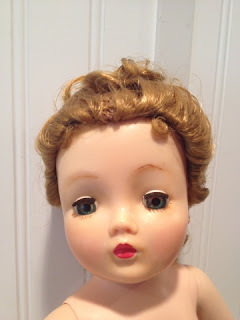 You will often find a doll with no lashes at all or with big spaces missing from her lashes. Luckily, replacing the lashes isn't very hard. It can be tedious, so it does require patience. This tutorial concerns replacing lashes in sleep eyes. 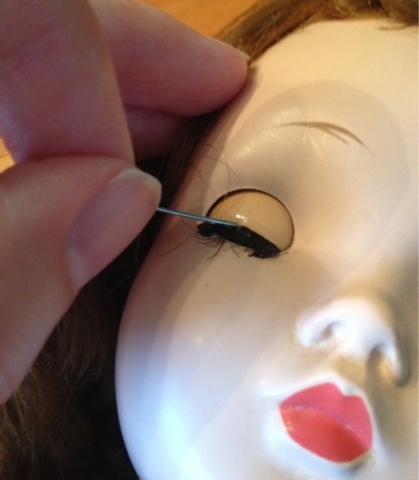 To view the tutorial on adding lashes to fixed-eye dolls go to my website: https://www.ateliermandaline.com/updates/tutorial-how-to-add-eyelashes-to-fixed-eye-dolls. 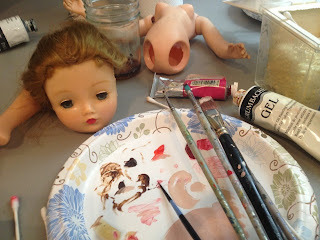 Here, I am replacing just a few lashes on each of this Cissy doll's eyes. When I am only replacing a few lashes I use these little Duralash flare lash extensions. These are made for people, and you can buy them where the false eyelashes are sold in most drug stores. 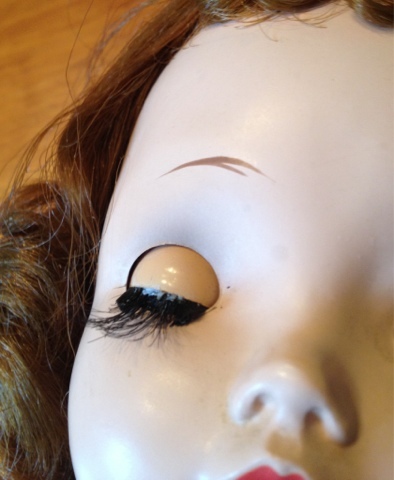 If the entire eye needs lashes then it is easiest to use tiny doll eyelashes, which you can purchase from my Etsy and eBay shops, link from my website. Another thing you can do is cut the bristles from camel paintbrushes and place them in the channel as I will show. That is quite difficult, however, and I don't think it looks much different than what I'm about to show you. Scrape the old glue from the lash channel. Start by gathering your materials. You will need whichever replacement lashes you chose, white glue, tweezers, a napkin or paper towel, tiny sharp scissors such as nail scissors, and a straight pin. To begin, scrape the old glue from the eyelash channel in the eyelid using a clean straight pin. Be careful not to remove the remaining lashes. Dip the lash root in glue. Using the pin again, dab a bead of glue into the eyelash channel. Be very careful not to get it in the eye. You just need a minute amount of glue. Clean the glue off your pin using the napkin. Next, using your tweezers, pick up an eyelash or section of lashes. If you are using brush bristles just get one or two at a time. Place the lash tip in the eye channel. 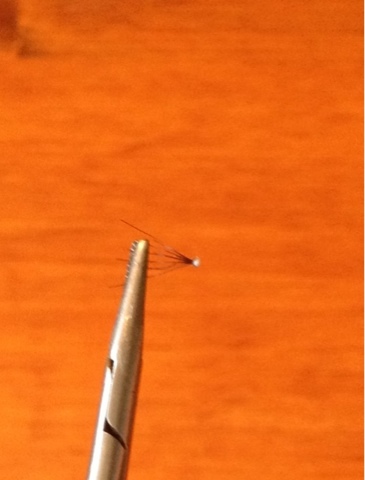 Using the cleaned straight pin, push the lash root into the channel. Commercial doll and human lashes will have adhesive on the root, which helps secure the lash. If you are replacing the entire lash, press the whole length of the lash into the channel. If you are only replacing a few lashes, repeat the process with new lash sections or brush bristles until the holes in the lashes are filled. Press the lashes into the channel with a straight pin. When you've finished replacing the lashes dip the pin in the glue again and draw a bead of glue across the top of the lashes right at the eyelid. You don't need much glue. Don't get the glue all over the lashes. Allow the glue to dry. White glue should dry clear. If the glue still shows after it is dry you can pick the extra out of the lashes with a pin, or paint over it with black/brown paint like putting on mascara. Draw a bead of glue across the lashes to secure them. 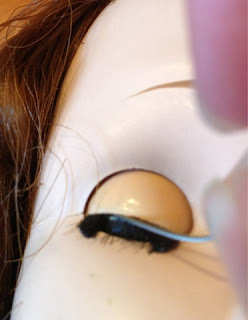 Once the glue has dried, trim the lashes to match the original ones. You might have to arrange the lashes a little with a pin to get them to lie properly and match the originals. If you are replacing the entire lash with human lashes you will need to look at a photo or an original doll to see how short to trim the length. Most hard plastic lashes taper slightly at the edges. When the glue dries trim the lashes to match the originals. Cissy looks so pretty with her replaced lashes! I often wish I could just stick thicker, longer lashes on myself! 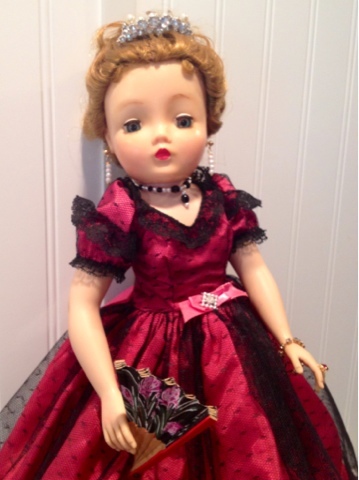 This Cissy already sold, but you can find many wonderful dolls in my shops. You can link to all my shops from my website. Cissy with her new lashes. Besides the dolls, we are working on the bonus room this weekend. Right now we have an old 1970s smoked glass and wood wall unit and some metal garage shelving housing all the books, toys, video games, DVDs, exercise equipment, and the myriad other flotsam and jetsam of family life we don't want lying out downstairs. This is also out guest room, so I really don't like having it in such a mess. Tonight we went to Ikea and bought a unit we designed ourselves. The center is an entertainment unit with sliding doors and on either side we devised bookshelves with doors. We chose white frames with high gloss gray doors, so it will be very bright and modern. The doors have no handles; you push on them to open them. The kids won't be able to slam them and they will have a nice clean, minimalist look. I think they will look great with the Day/Nighters from my Night and Day post. Tomorrow we are going to pick wall paint after church. I'm thinking a turquoise-gray if I can find it. I'll post pictures when we get the room finished. Restored Strung Ginny with Painted Lashes. Restored Ginny Straight-Leg Walker with Painted Lashes. 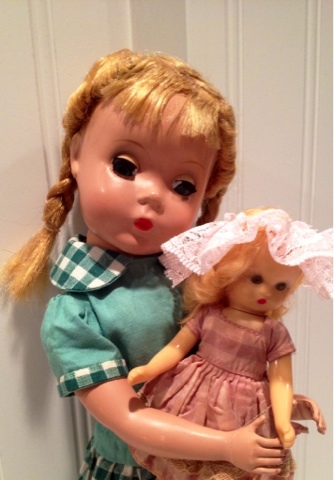 As promised in my last post, here are the two Ginny dolls from the big doll lot. Both are fully-restored now. 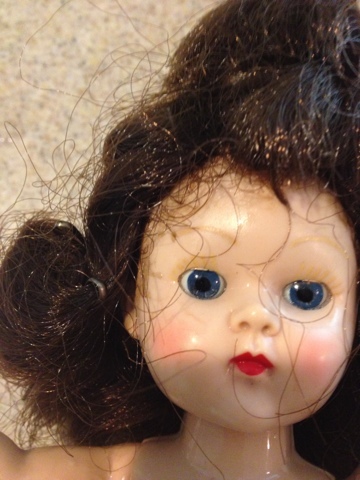 The main issue with these dolls is they had gotten quite dirty and grimy. The blond Ginny shown here needed re-stringing and some very minor splits repaired. The brunette just needed cleaning and a new hairdo, and to have her arms re-strung. Ginny with her new hair style. 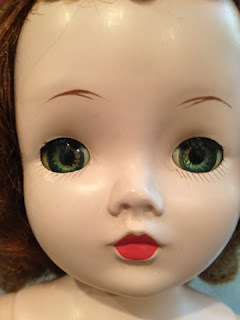 I restore a lot of dolls, but I don't often come across Ginny dolls. As I mentioned in my Fab Pam post, I am more a fan of the Lesney face Ginny. That's the Ginny doll I had as a child! Her face is thinner. I now realize that Ginny is supposed to represent an older girl, maybe 8 or 9 years old, whereas the original Ginny is supposed to look like a toddler. When I was growing up, though, I thought my mom's old 50s Ginny was ugly and mine beautiful. I didn't know they were supposed to be different ages! Also, you might remember from one of my first Betsy McCall posts, my mom's Ginny and Betsy were trashed by the time I came along. Both were missing limbs, their wigs were all messed up, and they were really dirty. After re-stringing, this Ginny can sit. Now that I'm a parent I can see the appeal of the toddler Ginny. I know she was modeled after the artist's daughter, Virginia. I especially like the little blond one. Maybe they're just so much cleaner than my mom's doll, I can appreciate them. I do think the combination of the blond wig and bright face paint with the little blue and pink dress is very nice. The brunette looks really good in her bright red polka dots too! The blue and pink dress is tagged Vogue, but I don't know the name of this outfit (if it had one). The red dress isn't tagged. It is a commercial dress. The snap has a Greek key design, and I've seen the same snaps used by Stashin for their Andrea (Ginny clone) doll, but I don't know if Vogue used the same snaps. The blue dress has a hook and eye closure so I can't compare them. I know just enough about Ginny to date the blond earlier than the brunette. For one thing, the blond is strung, not a walker, and her wig is mohair, not Saran hair. Also, the blond is marked only "Vogue Doll", whereas the brunette is marked "Ginny" and then Vogue Dolls Inc. and Pat. Pend., and Made in U.S.A.. I know Vogue originally marketed an unnamed toddler doll who was later named Ginny. The original hair pins seem to still be in place. The brunette Ginny still has pins in her hair which I think are her original hairpins. 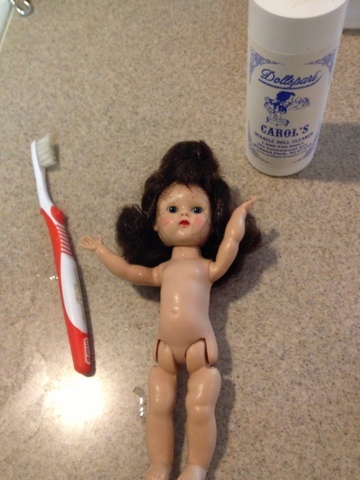 I cleaned the dolls with an old toothbrush dipped in doll cleaner. For the brunette's hair, I brushed it with a wire wig brush and rubbed a little fabric softener/water mix in it to clean and soften. When it was dry I only had to brush it around my fingers to get it to curl into a flip, so it didn't need a new set. I re-pinned the sides as they had been with the original pins. Then I wet the bangs and let them dry with a ribbon tied around them to get them to lie down like they're supposed to. The brunette is a head-turning walker. The walker works perfectly. As you can see, her eyes don't function. Occasionally I can get them to close by thumping her head really hard, but mostly they stay open. I can't get her to sit. I don't know enough about these dolls to know if the walkers were supposed to sit and I don't want to force it and break her, so I haven't tried. I re-strung her arms, though they are still somewhat loose. It's really hard to get the arms super tight without stringing the head, which isn't possible on a walker. They will hold a bit of a pose though. This Ginny has a mohair wig in need of re-styling. To re-style a mohair wig you can't brush it. That will ruin it. Instead, use a bamboo skewer or long toothpick to pick any dirt and tangles out and re-arrange the hair. Be very careful because the mohair tends to fall out of the wig cap. This doll's hair was already quite thin, so I had to arrange it carefully. 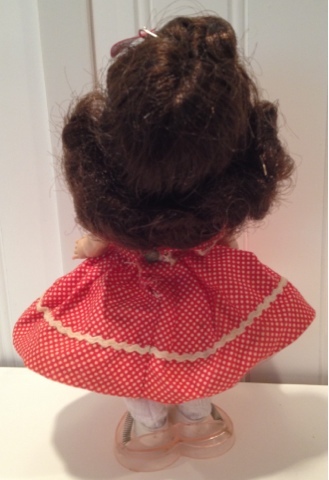 When you are finished, just dampen the hair and roll it on tiny perm rods using endpapers, just as though you're giving the doll a perm. Don't saturate the mohair or use hot water, as both can cause the hair to felt. Let the mohair dry on the rollers at least 24 hours. Then carefully unroll and arrange using the skewer again if you need to, or just your fingers. Spray with Mink hairspray if you can find it. Mink makes the mohair shinier. Around here you can only find it at Food Lion usually, so I stock up when I see it. 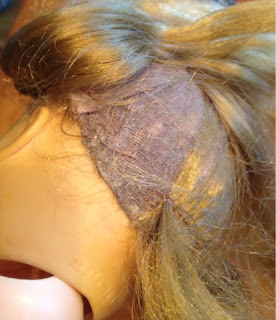 Before I re-strung the blond Ginny and styled her hair I repaired splits in both legs using epoxy and painted it when dry just as I describe in my McCall Twins Visit the Hospital post. 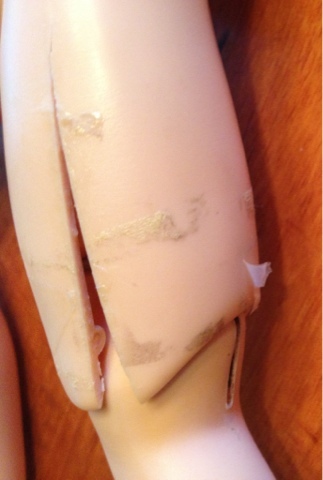 This doll also has obvious seams, but not splits, on her shoulders and crotch. These don't warrant repair at this stage; anything I did would look very obvious and ugly. If the doll is played with as a toy again they may eventually split, but it seems unlikely this doll will be used other than for display. The blue dress washed nicely. It still has some faint browning from age. The hat was a thrift-store find, but matches perfectly. 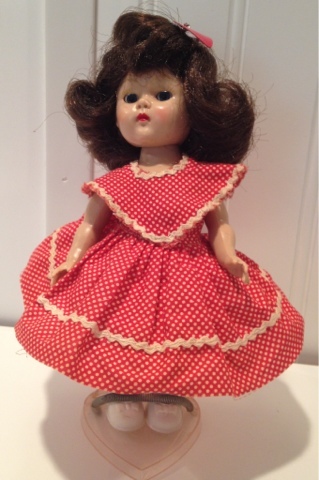 To clean the dolls' vintage clothing I first assess whether I think the outfit can stand up to hand washing. 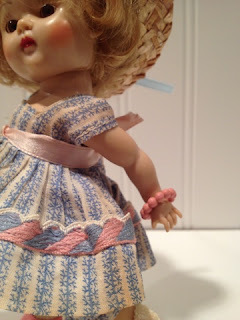 The cotton blue and pink dress looked as if it could and it was very dark and dirty, so it really needed it. The red dress is unhemmed so I didn't attempt to wash it. For the blue dress I first soaked the dress and bloomers in a 50/50 mix of white vinegar and cold water for one hour. Before you do this, rub straight white vinegar on an inside seam or some other inconspicuous spot to make sure it doesn't cause the fabric to bleed or bleach or tear. Then I dab Fels Naptha laundry bar soap on any stubborn spots and soak for one hour in a mix of cold water with gentle detergent and Snowy or other gentle non-chlorine bleach. Then I soak for one hour in plain cold water. When this is finished I gently squeeze the excess water out and let the clothes dry on a glass or bottle (to help them hold their shape) in the bright sun. Often clothes dried this way will hardly even need pressing, or won't need it at all! If you do press old fabric, use only a warm setting. The red dress was dry-cleaned and steamed. It turned out very well. To clean the red dress, or any other fabric I deem too delicate to wash, such as the old Cissy taffeta underclothes, I use a Dryel or other brand home-dry cleaning kit. First I gently clean with the spot remover or booster included in the kit, then I dry-clean it following the instructions on the package. These will come out damp so I dry in the sun as with the other method. Drying outside really helps eliminate musty odors. I don't iron these delicate clothes at all. Instead I hold the iron over them and steam them and smooth the cloth with my fingers while the fabric is still damp from the steam. The lashes and brows are somewhat faded, but the rest of the face is bright. 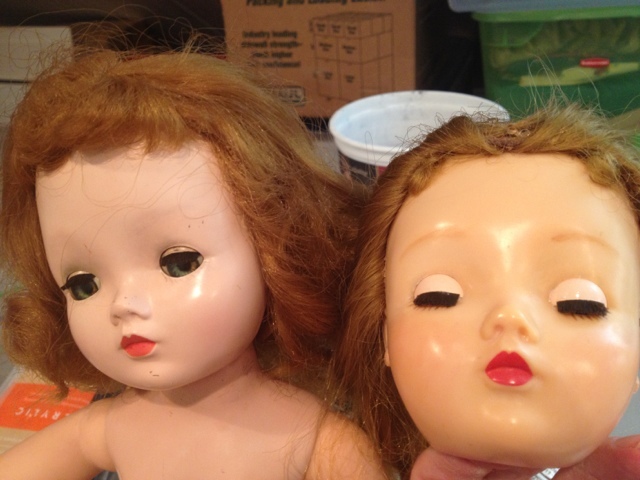 As you can see, these dolls didn't need the level of restoration I usually perform. They wore pretty complete outfits too. I added a thrift-store hat to the blue dress because it matches so well and fits Ginny perfectly. Everything else, including her pink bracelet, came on her! Ginny's original bracelet. Note the faint browning of the skirt on this side. The brunette Ginny came wearing the red dress and white taffeta bloomers and shoes. I added the heart-shaped hair pin. It came on a Roberta Ann doll in the same lot but was obviously not original. She was wrapped in strips of fabric secured with the heart pin rather than clothing! I do think it is a vintage pin, however, as everything in the lot was from the 1940s and 50s except for one Sindy doll. I added the vintage seed bead bracelet. I thought the heart pin looked really cute with the red dress. I also added vintage bobby socks from my doll stash. These are not rayon, so they are probably later vintage, maybe for Skipper. 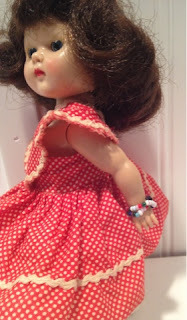 Then I made a bracelet from a vintage doll jewelry box I have. This came with all kinds of commercial doll jewelry, like a Cissy necklace, but also contained little thread necklaces which I think are homemade from vintage seed beads. I doubled one to make a cute little bracelet. I will say, though, I have seen commercial seed bead on thread necklaces since I got the jewelry lot, so it's possible they aren't homemade. Each doll comes with a Knickerbocker stand. I think these two little ladies turned out well. 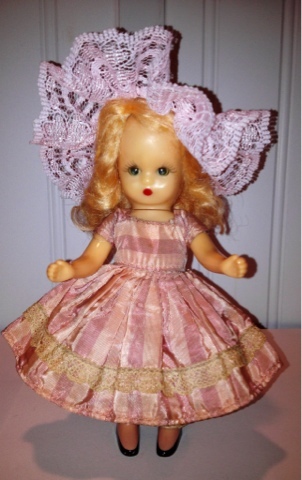 They are available for sale, along with many other dolls, in my store: http://stores.ebay.com/atelier-mandaline. 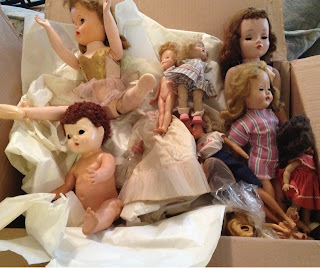 A new lot of vintage dolls to repair. Well, here it is, my 100th post! I didn't think it would take me so long to get here. Or maybe I should say I hoped I would have finished 100 posts sooner. I do feel proud to have been writing a lot more lately. I started this blog as a way to try to retain something of myself, the self I was before I became a mother. I love my family but I had started to feel as though all I ever did was laundry and cooking: thankless, endless chores. I definitely find my blog does keep me motivated to find a new project. Whenever I am tired or tempted to slack off I think of how bad it will look if I don't write a new entry for a month or something and I get to work! 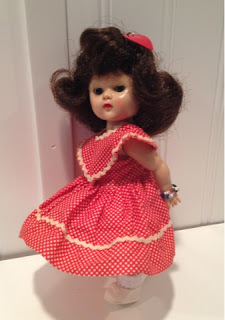 Nancy Ann, a Storybook doll. 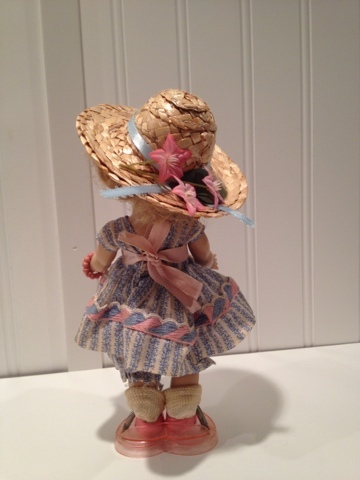 The first doll finished out of the big box you see is a sweet little Storybook Nancy Ann. Story book dolls have a special place in my heart. 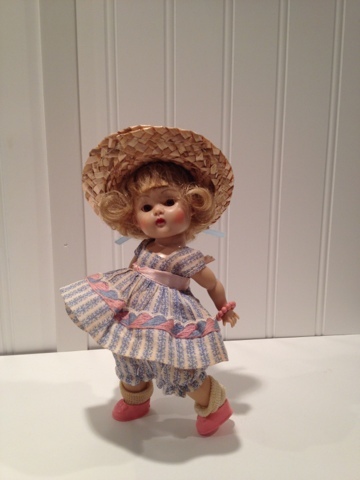 Even though the bisque Storybook dolls are more valuable, I prefer the hard plastic Nancy Ann because I was brought up hearing about them. Nancy Ann stars in a classic family story from my mother's childhood. this Madame Alexander Polly Pigtails. If you will bear with me, I have to tell another story before I can get to the one I'm thinking about. After World War II, as you may or may not be aware, it was very difficult to obtain an automobile. I'm not sure why, but I imagine it was because of wartime rationing of metal and shuttering of factories. At any rate, my grandfather came home from the war and, with a growing family and a new job in a different state from his family, was in need of a car. His boss, Mr. Snyder, a wealthy newspaper owner, had placed an order some time before for a new Rolls Royce. Seeing that my grandparents needed the car more than he, Mr. Snyder agreed to let them have the Rolls when it arrived. The Rolls Royce came in a giant wooden crate, and my grandfather, ever frugal, put a window and door in the crate and wired it for electricity and turned it into a playhouse for my mother and aunt. Later, in my childhood, it was a garden shed. Vines grew all over it then, except for the window and door, and gave it a fairytale feel. I was entranced by the tiny house and wished I could have it for a playhouse, but by that time my grandfather had taken it over. As for the Rolls Royce, it is famous in our family. My mother can remember it well. It had little vases in holders in the back so you could have flowers in the car, and the floor would slide out some way to make a big space the children could sit in and play paper dolls. My grandmother became the secretary of the Rolls Royce Owner's Club. Eventually my grandparents sold the car for just $1000, which my uncles are still lamenting to this day! At any rate, for some reason my grandparents put their old electric toaster in the playhouse and someone plugged it in. Well, my aunt, who is four years older than my mother, had some beloved Storybook Nursery Rhyme dolls. They were the hard plastic ones like the one I have. My mother was playing with my aunt's dolls and decided to put them "to bed" where they'd be nice and warm...in the toaster! This was the old type of toaster with sides that folded out and which you closed up after you put in the toast. Of course, the toasted dolls were melted. It's a wonder the shed didn't burn down! Well, my aunt is resentful and my mother not all that sorry even now. 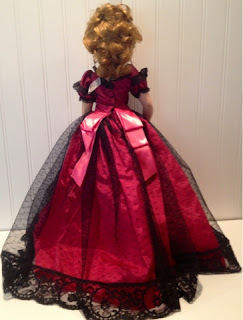 I grew up hearing about Storybook dolls and the terrible loss of them, so they seem very special and important to me! The ultimate doll that got away! After Nancy Ann, I finished an adorable bisque baby doll. 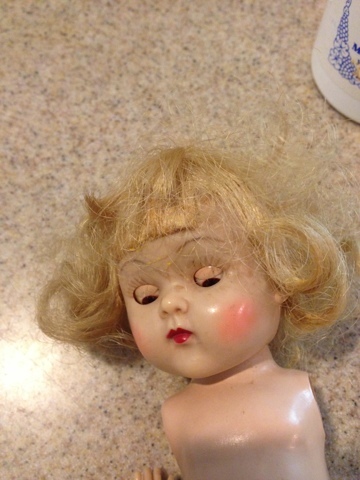 This doll is tiny; just about the size of my thumb! 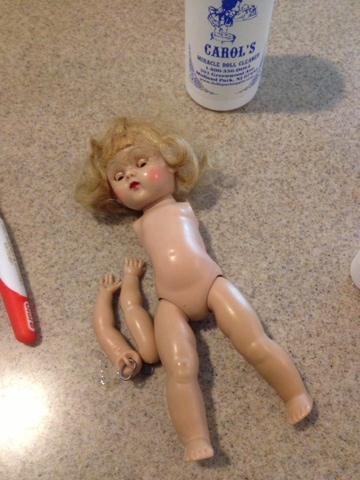 Still, it has jointed arms and legs and wears a little diaper. It is marked "Japan" on its back. I guess it was made for a dollhouse, but it is also very cute when held by a larger doll. It just needed re-stringing. I took some photos with a vintage Ginny walker holding the baby. Ginny is another doll from the box. She's nearly finished...just needs her clothes cleaned up. The box contained this brunette painted lash walker with a Saran wig and an earlier blond strung Ginny with a mohair wig. I am nearly finished with both. All these will be or are for sale in my store, so please check: http://stores.ebay.com/atelier-mandaline. We had a lovely day today, so we went to Black's and bought plant starts for the garden. We got many tomatoes, Giant Marconi banana peppers, cucumbers, eggplant, zucchini, and many different herbs. Besides plants they sell all kinds of local produce and things like bread and Ashe County cheese and eggs. I discovered Jussto cheese by Troyer as well. This could be quite dangerous, to have access to Jussto, also called Ostbrod or Juustoleipa cheese, here in town! Jussto is a baked Scandinavian cheese. The name translates as "bread cheese". It is very salty and squeaky. You serve it warmed. Even though Heidi wasn't Scandinavian, I always imagine Jussto cheese when Grandfather serves her toasted bread and cheese! Besides my dolls and my garden, I am always working on my exercise. I am still having to walk, as my foot hasn't healed all the way. I don't want to push it because our neighborhood is having its own version of the Amazing Race in June and I want to be in top form! But pretty much every day I am walking, rain or shine. Yesterday afternoon we got the strong storms going across the country. By the time I was walking it was just drizzling and I saw this lovely sunset. In light of recent events in our country I am adding it to this post. I was reminded when I saw it of the beauty we can find in this life, even in the wake of a terrible storm. 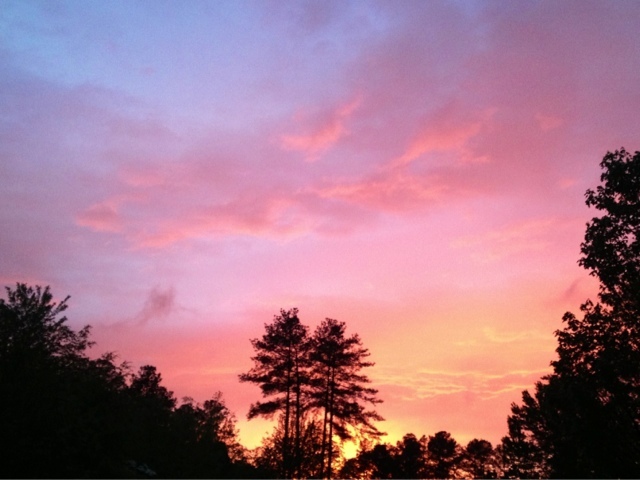 A beautiful sunset following a terrible storm. 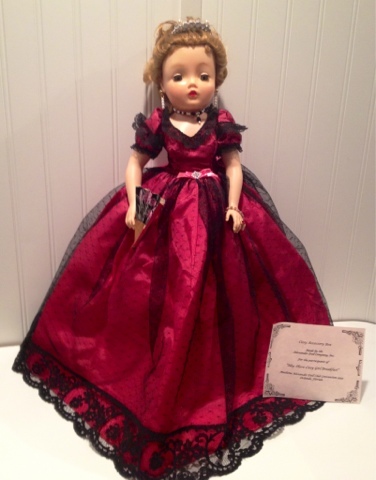 Madame Alexander Cissy doll after restoration. I do apologize to my eBay viewers and those who read my So Many Dolls post who've been waiting for this post. I've been busy, busy lately with work. That's a good thing, so I'm not complaining! Here, finally, is Cissy restored in all her glory. I love dolls, in large part, because I love history, and dolls are an enormous help in understanding the past. In particular, they are a wonderful window into the history of women, so under-documented and taught. 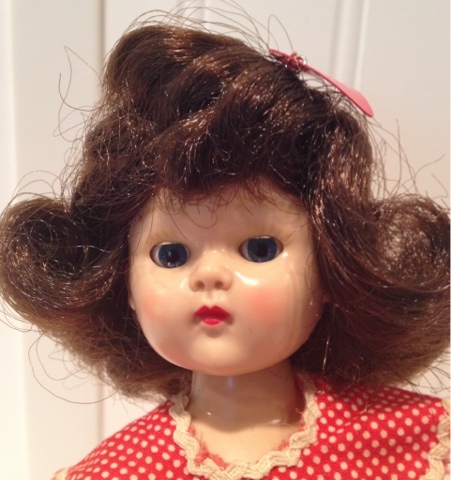 With only a few exceptions, women have historically been the big players in the doll world. They design the products, they run the corporations, and so you can understand their lives so easily when you view their work. 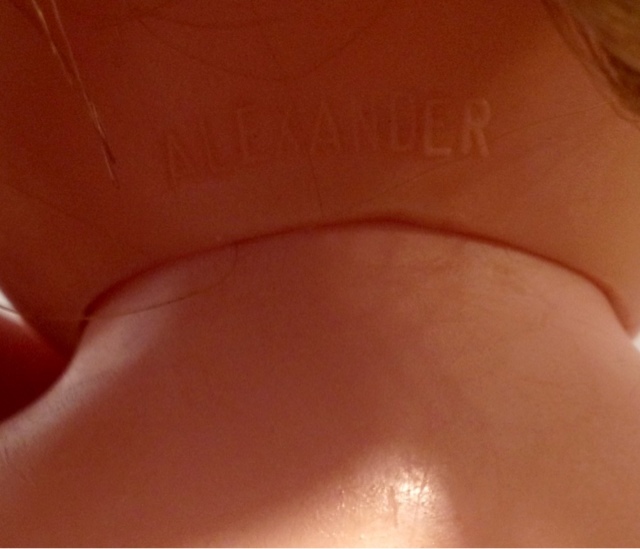 Madame Alexander is probably America's most famous doll entrepreneur, for good reason. "Madame" Beatrice Alexander built her father's small doll repair shop into an empire, using the misfortune of World War I to her advantage. 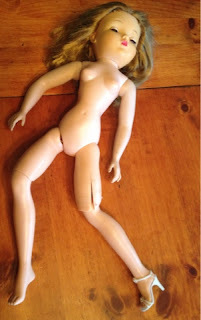 When bombs destroyed the bisque doll parts stock her father had imported from Germany and France she began making and selling her own cloth dolls. In time she became famous and powerful enough to command the attention of large corporations like DuPont, and she was able to persuade them to allow her to experiment with new materials for her dolls. I've read Cissy was modeled after Beatrice herself. I love vintage Cissy's face. She seems so aware of her own importance and fabulousness. I always think of the girl in the Jet song who's "so sweet, with her get back stare"! Cissy should feel important. She's an icon among dolls. She's the very first fashion doll marketed to young girls. Without Cissy there would be no Barbie, no Bratz, no LIV dolls, and on and on. Before Cissy girls were given dolls that resembled babies or children to care for or dolls representing other ethnicities to encourage education. Lenci and other companies did make many lady dolls in fabulous and fashionable dresses, but these were marketed to adult women as home decor to "decorate the corner of your limousine" or to place on the bed (thus their descriptive term, "boudoir" dolls). I have seen one Lenci ad which promoted their dolls as a means to encourage "artistic tendencies" in one's children, but it doesn't advise mothers to encourage the child to think of herself as an adult. Beatrice Alexander took a lot of abuse over Cissy, who was both controversial and sought after right from the start. I think Beatrice saw, however, the real need for girls to imagine themselves as something other than mothers and homemakers. Cissy provides that model. Maybe she is or will become a mother, but she is most importantly herself first, with her own hopes and dreams. And of course she has her own fabulous wardrobe! 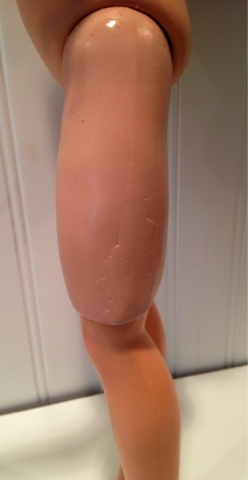 This particular Cissy was obviously used as intended; as a child's toy. I am always happy to see a doll who was well played-with and loved. I don't like to see them abused, as with the next Cissy I will restore, who was obviously desecrated on purpose, but I think nothing is more sad than to see one of these gorgeous dolls never removed from the box. Never loved or played with, decaying over the decades, like the Revlon doll in my Revlon-ution post...it's a shame. When I got Cissy she had several needs. Her thigh had split and someone tried to fix it with packing tape. Her stringing was loose. Her wig had lost quite a bit of its hair, and her face had darkened. 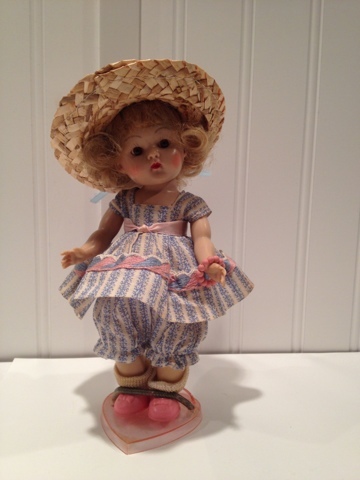 This Cissy is a later model doll. 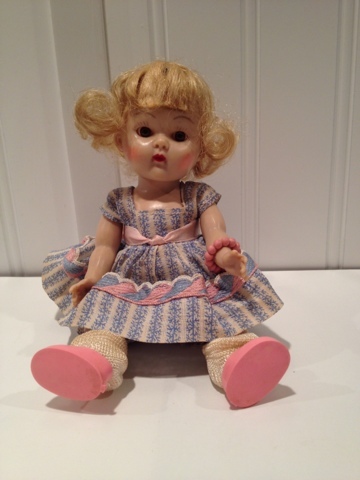 I've read on one expert's blog that this doll was only produced from 1960-61, but I've also seen this doll on eBay dated from 1958. At any rate, she was last Cissy produced before Alexander changed to the "Jacqueline" face modeled after Jackie Kennedy. Someone tried to fix the leg with packing tape. The body is still hard plastic and the arms are vinyl, but they are a different, harder type of vinyl and are not jointed. The face is often described as "vinyl", but it isn't, or at least it isn't vinyl as we think of it today. 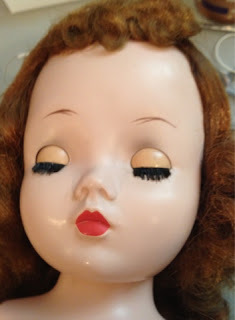 It is very hard, and more translucent than the original painted, hard plastic Cissy face. This face is very prone to yellowing with age. The paint color is "infused" in this face, also, so it is tricky to re-paint. The infused face is prone to yellowing. Note the difference between the earlier painted face Cissy and the infused face. I've devised a method to clean and re-paint these faces. It isn't perfect, but it ends up working quite well. First, to remove the yellowing, I clean the face with a Mr. Clean Eraser. You will see a huge difference after a while in the color. The trouble with this is that even though the color is infused, the top layer of paint, like eyebrows and eyelashes, will come off. Usually, these dolls are largely missing them anyway, but in the infused face a shadow of the paint will remain under the surface. After the face is clean, wash it with dish soap and rinse thoroughly to prepare it for painting. The infused face doesn't accept paint well. I've experimented with both oils and acrylics. They sit on the surface and don't adhere, so even dry oil paint can often be rubbed off with a Q-Tip. To combat this I use pure oil paint with no added mediums. On a regular painted-face Cissy, for example, I will usually mix the oil paint with Gel or other medium to make it more transparent for cheek blush and eyebrows. In the case of the infused plastic face I use a method more like staining wood. I rub the pure pigment on where I'd like the cheek to be blushed and let it sit for a bit to sink in. Then I rub it off with a makeup sponge and repeat the process until I have the color where I'd like it. For eyebrows and eyelashes I use pure burnt umber mixed with flesh color to give the paint a more transparent look and paint it on with a tiny brush. I let it dry for a long time and when it's dry I seal the face with gloss varnish. You can still see a slight shadow under the brows where the plastic was infused with color, but I don't find it unattractive. I just paint the new brows a bit thinner than the originals to compensate. I've heard you can use water colors and then seal them with varnish but I haven't tried that. 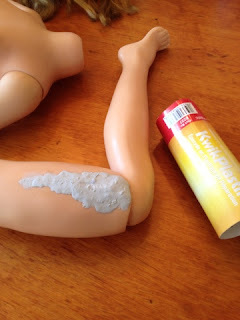 To repair the split in the leg I apply Kwik Plastic epoxy. When it's dry I sand and paint it with oil paint. This knee had the spring removed. The knee probably split in the first place because of a stiff spring. I restrung the knee with cord more loosely than the rest of the body to protect it from splitting again. The knee is repaired with epoxy. After sanding and painting the repair is not very visible. After the doll was re-painted and re-strung I turned my attention to her wig. She had quite a bit of hair loss and breakage and her wig was coming unglued along the edges of her face. I was worried at first that I might need to sew in an extra layer of hair. I found, however, I was able to style it to hide the wig cap. The hair before re-styling. You can also see how yellow the head was before cleaning. When styling saran hair, first, I comb out the hair using a wire wig brush. I wash the hair in a mix of fabric softener and water and rinse it out. Then I apply a little more to any dry areas as a leave-in treatment. 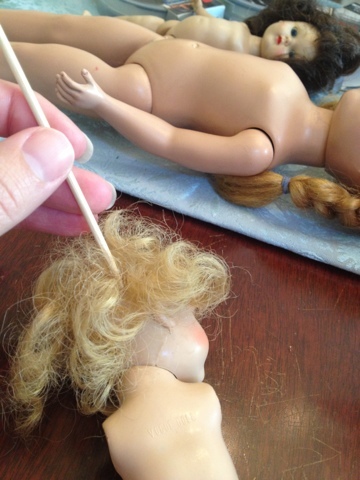 I then roll the hair on tiny perm rods using endpapers, just like I'm giving the doll a perm. I set the curls by pouring very hot, almost boiling water, over the curls, being very careful to avoid the face and eyes. I let the hair dry on the rods for 24 hours at least before I unroll them. 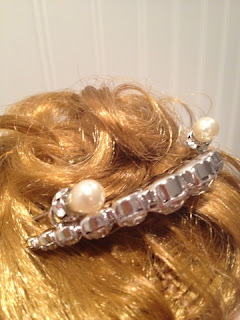 Then I sew the hair in place to the wig cap if necessary, and pin the longer curls into place. You can see in the photo above how the hair was originally sewn into place. Sewing, rather than using elastic bands, gives the hair the proper vintage look. I spray the hair with Mink hairspray to set the style and make the hair shiny. Now that the doll is completely restored she can hold many poses. She can sit and can stand alone with careful balancing when she is wearing high heels. I do recommend using a stand, however, since the old plastic is fragile and the repaired knee is loosely strung. The restored doll can sit. She can stand alone with careful balancing. When the doll is finished I can dress her. That's the best part! 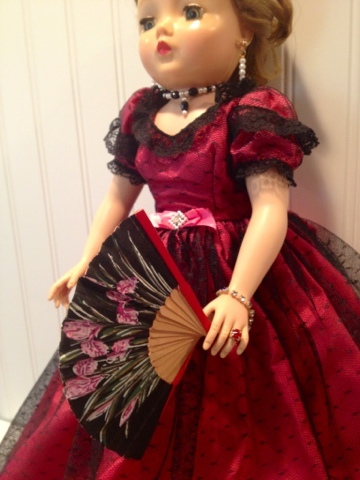 For this doll I was able to purchase a slightly younger dress that went to the Goya Jacqueline face Cissy. It's in nearly perfect condition. I also have several accessories in my doll "stash". The tagged "Goya" gown is perfect other than a bit of fraying at the edges of the ribbons. Cissy wears lots of lovely jewels. I buy lots of dolls clothes and accessories and save them for the perfect doll. In this case, I had a box of untagged Cissy items, from which I took the nylons, shoes, and necklace and earrings. Then, I had another box of accessories that had been made for Cissy and were available only at a breakfast during the 1999 Madame Alexander convention at Disney World. From that box I took the hair ornament, which can also be pinned to clothing with two stick pins or strung on a chain as a pendant. I also took the ruby ring from that set. The fan was something I had purchased in a vintage fashion doll lot a while back. 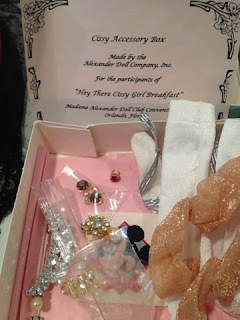 The Cissy accessory box I split between vintage and modern Cissy dolls. This ornament can be used several ways. 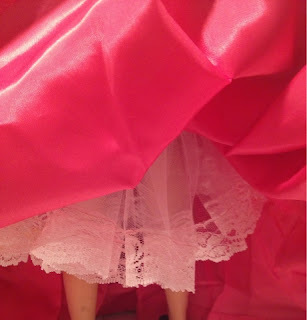 I made a crinoline for Cissy using three full yards of tulle and vintage pink lace. In places the lace has yellowed from age, but I think this makes it look appropriate the the age of the doll. The slip helps the gown stand out, but it is short enough to use under a day dress as well. Now that Cissy and Revlon and my Betsys are finished I have been mostly working around the house today. I did have a case of Target withdrawal last week. We went from having two Targets in town about 5 minutes away to not having one at all. Now I have to drive 30 minutes each way to shop there. I was lucky to find lots of endcap clearance sales while I was there, so my store has lots of modern toy inventory in addition to these vintage dolls. Check it out at: http://stores.ebay.com/atelier-mandaline. Jerry helped me out with a novel solution to a problem I've been having in the garden. I mentioned in the last post, I think, that the seeds we planted didn't come up, though the bulbs and roots had. I thought the seeds were too old, but it could also be the work of a very adipose robin who hangs around in the garden all the time. This robin has some attitude, too. You can go out there and yell at him and he just gives you a baleful glance and goes on his way. He might have eaten the seeds. Well, besides our fat robin, we had a squirrel in the garden digging up the onions and garlic. I didn't know what to do about that, but Jerry suggested a "scarecrow" of sorts. The day we moved into the house back in November our youngest was scared to go in the yard because he said "something is sleeping out there". "Something" turned out to be an abandoned garden gnome lying under a tree. We laughed about it and propped it back up under the tree and told him it was fine, but he still wouldn't go to that part of the yard. Well, a few weeks ago I saw out of the corner of my eye what I thought was a man in our yard! It scared me to death until I really looked and saw it was just the gnome. It had appeared so much larger, though, and as if it were moving! There's definitely something creepy about it! But, we've moved it and another gnome we found to the garden and that squirrel stays away now! It doesn't work on the robin, though. He just doesn't care! Luckily, now that we explained how the gnomes are helping keep the squirrel away, our son isn't so scared of them. 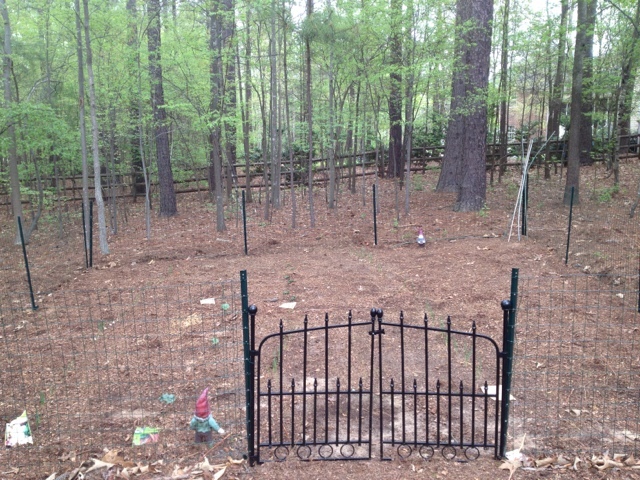 Our garden with its guardian gnomes.